wow what a fresh tomatoes from ur own garden, lucky u ^_^. what would u do with those tomatoes? got rabbit kat rumah u? apa lagi Gert, tangkap and buat burger rabbit lah. 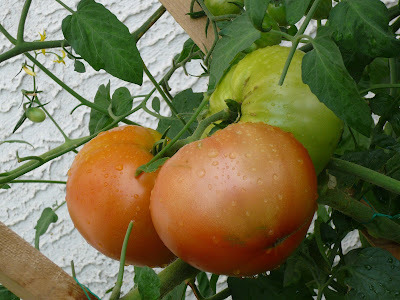 hehhehe..
Eh bencinya, I see your tomatoes so big. Wah some more got so much in your garden! Makes me want to have a big bite on it. Isha, I normally will just eat the tomatoes fresh with some salt and balsamic vinegar. 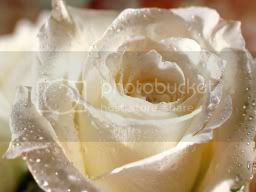 Sue, too bad you live so far from me if not I can share it with you. 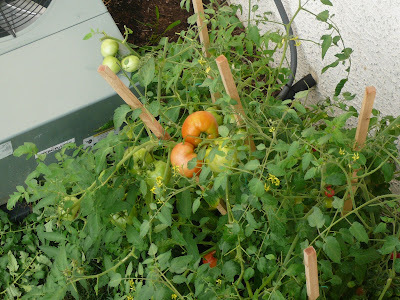 The the small tomatoes is really sweet and the bigger ones really juicy. 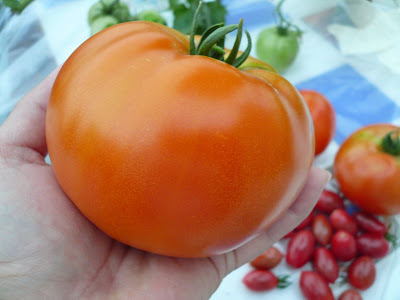 Gert,I envy you have nice and big tomato! 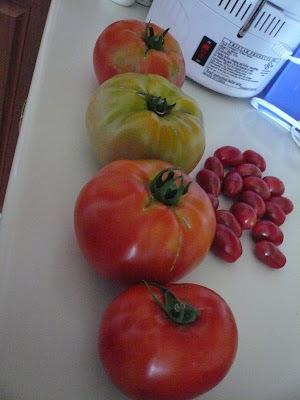 !The big one is sooo beautiful.Next year,I'm going to buy tomato plant from HomeDepot as you advise. Beachlover, just buy those tomato plant from HomeDepot. It grown faster. I'm just wondering where I can find green tomatoes. I have been looking for at some grocers, still I can't find them. Sometimes I need those for making samba lado mudo. 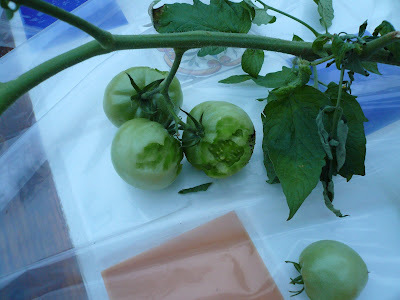 andaliman, I am not sure where you can find green tomatoes in Canada. Maybe you can try asking the vendor at Farmers market. Since most of them sell their own produce they might be able to supply you some. I will check our samba lado mudo recipe.